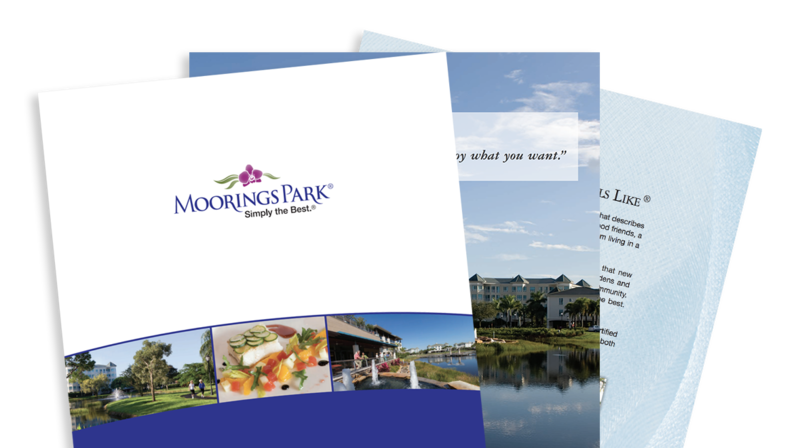 Moorings Park Grande Lake, located on the south side of Golden Gate Parkway, between Airport-Pulling and Livingston roads, is being developed by Moorings Park, the premier provider of active retirement living in Southwest Florida, in partnership with London Bay Development Group. Building F, with 12 residences, is located adjacent to the community’s spectacular clubhouse and overlooks a large lake with the golf course beyond. Open kitchens feature an island counter with sink and seating, granite countertops, and GE stainless steel appliance package. The master bedroom features his and hers walk-in closets, while the master bath has his and hers sinks on opposite ends of an expansive granite countertop, a recessed shower for easy entry, and a private water closet. Both guest suites, located at the opposite end of the master bedroom, have a walk-in closet and a full bath. The study, approximately the same size as a guest bedroom, is positioned just a short hallway away. “The Brook floor plan, like all of the floor plans offered at Moorings Park Grande Lake, was designed for the ultimate in livability,” said Lavender. “They were also designed to feel like a single-family home, with large open spaces. Lavender also pointed out that more than 70 percent of the residences offered at Mooring Park Grande Lake have more than 3,000 total square feet, including incredible lakefront lanais. “The size and design of the residences are just two of many factors that make Moorings Park Grande Lake different from any other Life Plan community in the Naples’ area,” Lavender said. As Director of Sales for Moorings Park Grande Lake, Gina Paris talks with potential new residents on a daily basis. One of the first things she notes is that Moorings Park Grande Lake is not your typical retirement community. An oversized master suite and separate, spacious guest quarters insure that owners and their guests have plenty of privacy in their personal retreats. Residences include private elevator vestibules as well as walls of sliding glass doors, which separate the great room from the expansive outdoor living areas, retract back creating the perfect setting for entertaining family members and friends. According to Paris, there is one other major benefit to living in Moorings Park Grande Lake. Situated on 55 acres in the heart of Naples, Moorings Park Grande Lake will combine magnificent vistas lakes and championship golf with luxury homes and exceptional healthcare. Entrance fees start at $1.5 million and are 70 percent refundable. Assisted Living, Memory Care and Physician Services are included with residency. The physical environment presents an innovative and resort- style blueprint that provides for seamless physical and visual experiences. It also maximizes the beauty and appeal of waterfront living combined with high-end materials and services. A few of the planned outdoor activities or amenities include a yoga pavilion, walking paths, lakeside parklettes with boardwalks, gardens, fire pits and overlooks, several bird- watching posts, and bocce and pickleball courts. The social gathering areas were designed so family members and friends can join in the many and varied on-campus activities. The clubhouse, as planned, will feature casual and fine dining venues, a private dining room, long curved bar, art studio, state- of-the-art fitness center, strength and cardio area, salon and spa, golf simulator, and a resort-style pool with poolside cabanas. It is open Monday thru Friday from 8:30 a.m. to 5:00 p.m., Saturday, 10:00 a.m. to 4:00 p.m., and Sundays, 1:00 p.m. to 4:00 p.m. Information is available at MooringsParkGL.org, or by calling (239) 919-1620.